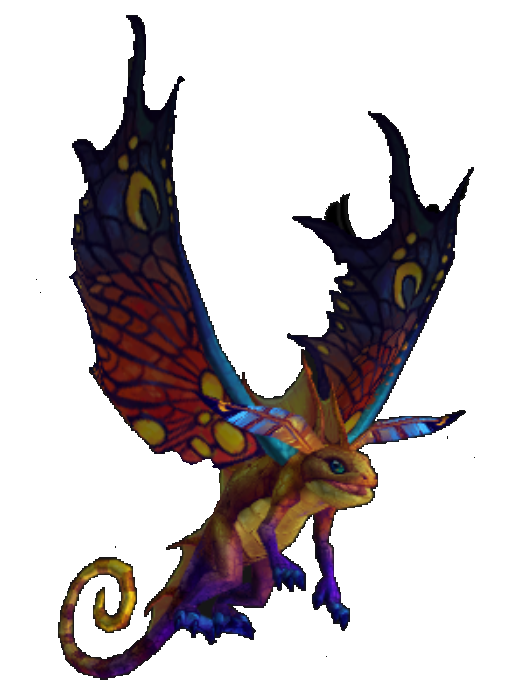 With this guide we will be looking at the Sun Darter Hatchling, a secret battle pet found in the Cavern of Consumption. The secret was solved on 16/06/17 and took approx. ~16 hours on the WoW Secret Finding Discord. 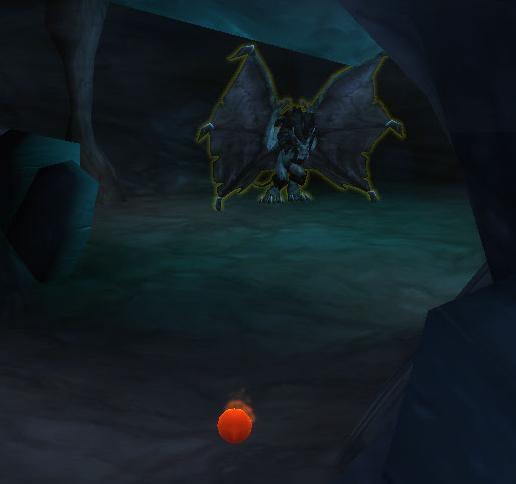 The pet is looted from https://www.wowhead.com/object=272487 which is found at the back of a cave in Winterspring. The cave is called "Cavern of Consumption". This cave contains many puzzles which can be solved by using consumable items on your character. You do not need to be a certain class/spec, nor need certain professions. 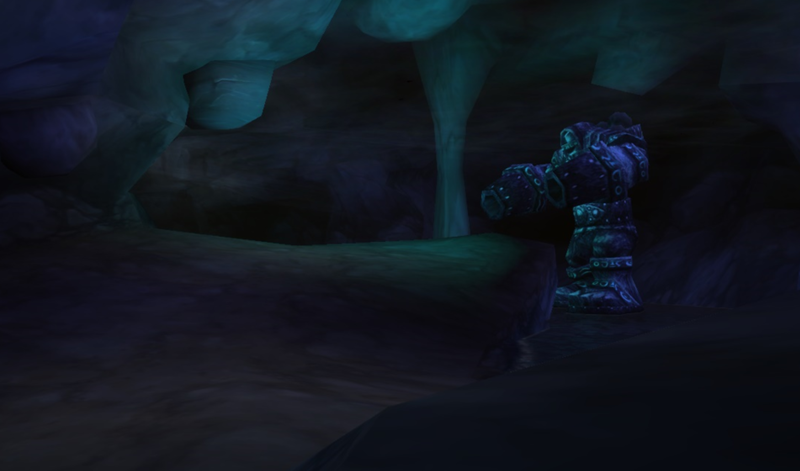 Upon entering the cave, you will have a debuff applied which silences you (https://www.wowhead.com/spell=248818), preventing most ability casts and disabling the use of toys. Failing a puzzle will either block you from progressing or port you to the cave entrance. Ensure to stay on the path while making your way through the cave. There are a lot of anti-cheat mechanisms built in and straying off the path could trigger this, porting you to the start. Logging out inside the cave will port you back to the entrance upon logging in. The pet is cageable and tradeable, however it is one loot per character. 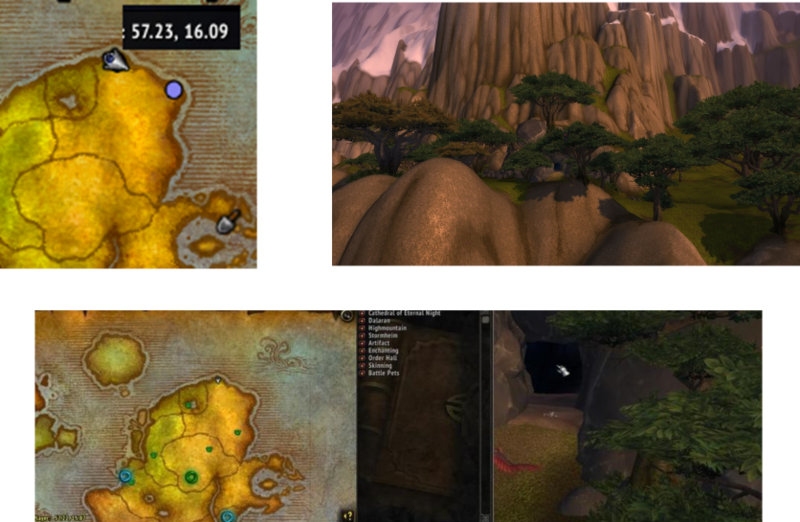 The images below show the location of the cave, both on the map and ingame. The cave resides in the north of Winterspring. Flying out into the sea and looking back will help you spot it easily! Following this section of the guide will obtain you the pet as fast as possible. A full guide is found below if you would like more information. Enter the cave and use the 6 Major Protection Potions. Run through the fire barrier and the fel barrier. Use http://www.wowhead.com/item=8529 until you obtain the skeleton transformation effect. Run past the Diligent Watcher. There will be 2 barriers, make your way to the vines (not the blue barrier) and use a charge of http://www.wowhead.com/item=89373. You can now walk through the vines. There will be a pool of water in this room which contains some stones. Collect one, use it and run out the room. You will now have a buff that allows you to walk through the blue barrier. On the other side of the blue barrier is a stone golem. Use the http://www.wowhead.com/item=38320 and walk past him. Make your way up the ramp to the right and to a barrier which is transparent and slightly purple. Use http://www.wowhead.com/item=44958 to pass through it. Inside this room, there will be a stone. Use http://www.wowhead.com/item=18258 and http://www.wowhead.com/item=12820. Interacting with the stone will give you a buff: Mark of the Second. Leave this room and head to the path which is blocked by a gate (note: The path to the egg may now be open, do not enter it yet). Use http://www.wowhead.com/item=40195 until you transform into a gnome. Walk through the gate. Summon http://www.wowhead.com/item=49912 and use http://www.wowhead.com/item=103789. Interact with the cube and select . You can now leave this room, and head towards the egg room. Cancel (right-click) the http://www.wowhead.com/item=12820 buff and use http://www.wowhead.com/item=955. You can now cross the water, interact with the egg and receive the pet. 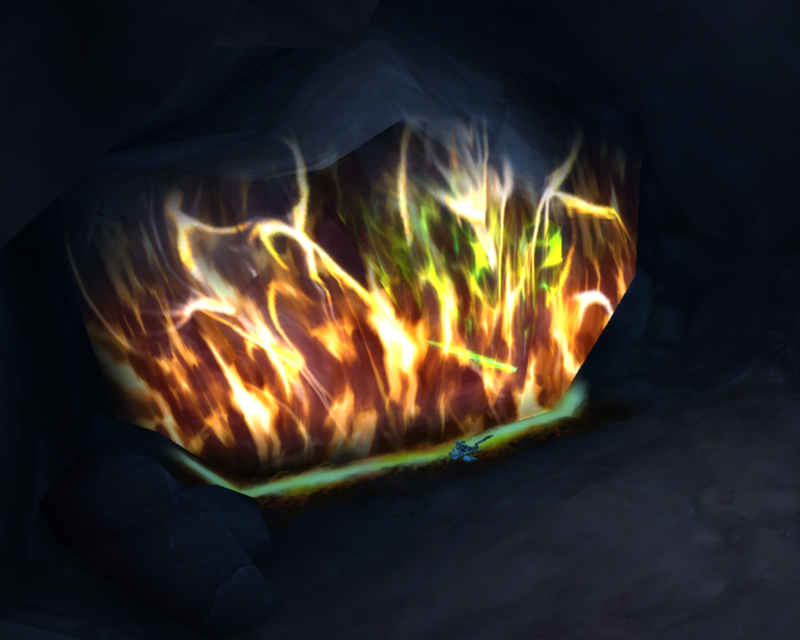 The first puzzle you will meet are the 2 elemental barriers: Fire and Fel. Using a http://www.wowhead.com/spell=28571 will allow you to walk through this barrier, as you will be protected from fire. Passing through the fel barrier follows similar logic. As fel magic is chaos, and chaos contains all schools of magic, using all the Major Protection Potions (i.e. having all 6 buffs) will allow you to pass through the fel barrier. Past the barriers, you will find a stone gargoyle (named “Diligent Watcher”) guarding the path ahead. If you attempt to cross its path, it will port you outside of the cave. The only way it will allow you to pass is if you are in a skeleton form, gained from http://www.wowhead.com/item=8529. This could be because it stops you from breathing, and the watcher does not allow living things through. The path is now split. Down one path, a barrier similar to the elemental barriers, however, coloured blue. There is also a passage blocked by a wall of vines. 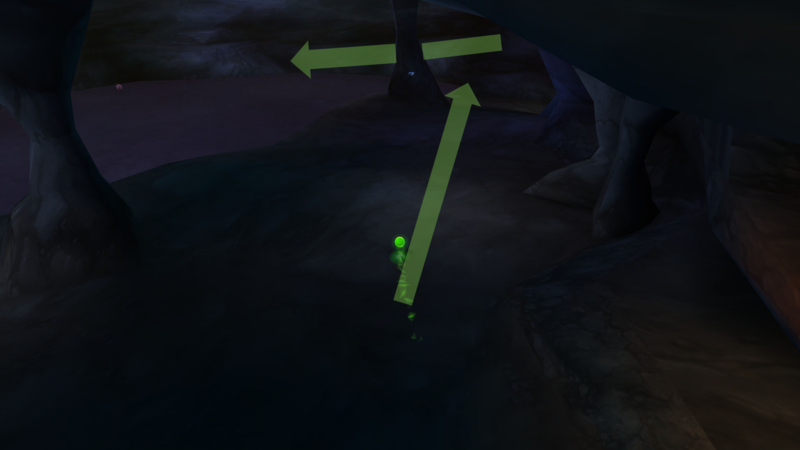 This puzzle is solved by firstly passing through the vine wall and collecting a https://www.wowhead.com/item=147455 (which exist behind the vines) which allows you to pass through the water barrier. Using a http://www.wowhead.com/item=89373 charge will transform your character, and attune yourself to the vines, allowing you to pass through them. In this room you will find a pool of water with items inside: https://www.wowhead.com/item=147455s. Collecting one and using it will grant you a 15min buff: “Wet”. This allows you to pass through the water barrier and continue deeper into the cave. The stone golem awaits you after the water barrier. To attune yourself and solve this obstacle has a quite simple solution. Using a http://www.wowhead.com/item=38320 will allow players to pass the golem safely. This could be because dwarves used to be made of stone before the curse of flesh. The path is now split into 3, with a puzzle guarding each room. Making your way down the ramp will lead you to the final room, where the pet resides. Going up the ramp will lead you to the Stone room and the Cube room. You must both visit and complete each room at the top of the ramp before you can obtain the pet. We recommend you start with the Stone Room. Green: Down the ramp, towards Egg Room. Heading up the ramp and taking a right will bring you to the Stone Room. This room is guarded by an Ethereal Barrier. Therefore, drinking http://www.wowhead.com/item=44958 will allow your character to pass right through, into the room. In this room, there will be a Strange Stone with a hole in it. The goal here is to make your characters arm fit the hole by using consumables to increase your size. You can do this by using a http://www.wowhead.com/item=18258 and http://www.wowhead.com/item=12820. This will increase your characters size enough for you to solve the puzzle. If done correctly, interacting with the stone will grant you a buff. Here is the solution to the riddle. "timeless ones" - Blizzard Developers. "sign of the first" - The 2nd buff needed. "creators" - Most likely referencing Muffinus, a Blizzard developer known for his odd attraction to Pugs. "most amusing heir" - A Pug with a princess hat on, of course! Select this, and you will granted another buff. You can now leave this room, and head towards the Egg Room. The greatest of achievements begins with the smallest leap of the mind. The "achievement" here is solving the cave and obtaining the pet. To solve the final puzzle, we must solve this riddle; what is “the smallest leap of the mind”? The answer is a rank 1 http://www.wowhead.com/item=955. Using this scroll (you may have to right click/cancel some of your buffs. It is safe to do so at this point) will allow you to cross the water. Some have reported failing the puzzle even though they have a http://www.wowhead.com/item=955 buff on them. We recommend following the below route, hugging the right wall, to avoid this. You are now safe to loot the pet! Congratulations! Hey, I'm Super, writer of this guide and owner of the World of Warcraft Secret Finding Discord! A HUGE thanks to all the Staff and Contributors to help make this guide possible. Come join us at the link below! !